This thread was developed by Bowworks and has become increasingly popular over the years because of its superior engineering and design. This thread form is designed for repeated lateral transport with steep angles for low friction and polished rounded crests and valleys to avoid cutting into the softer metal of the eyelet during the many decades of use this thread was designed to perform for. We feel confident that our new bow screws are the right thread form for violin family member screws and eyelets and will still be in service 200 years from now. The screws are made of stainless steel and the eyelets of bronze. Bronze is much stronger and more corrosion resistant than brass. Also, bronze is harder and more abrasion resistant than brass. Linked with stainless steel screws, these screw sets will last a lifetime. 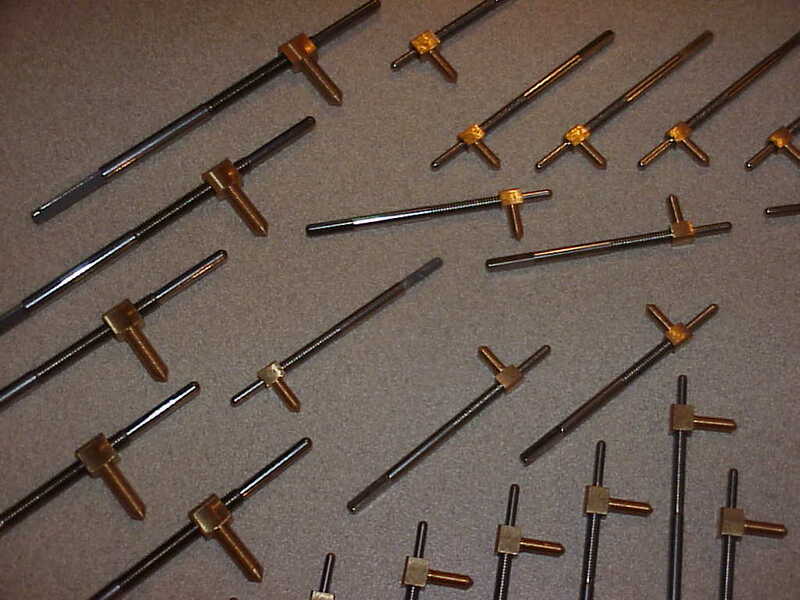 We offer these in overlength blanks as well as in finished lengths for Violin and Cello. Our violin screws and eyelets are made by Paulus GmbH of Germany. Paulus has been recognized worldwide as the leading manufacturer of violin bow parts and they have maintained this leadership position by setting the standard in quality for generations. Bowworks™ Thread Screw Blank Sets (extra long blanks).